New York in a Weekend - It Really Can Be Accomplished! The Big Apple. New York City. NYC. If you can make it there, you’ll make it anywhere. And New York in a weekend seems impossible. Home to over 8 million people, New York City truly is a multicultural wonder. You’ll hear as many as 800 languages there, making it the most linguistically diverse city in the world. The many districts and landmarks of New York City are world-famous through films and TV. Statistics show that over 50 million people visit every year. 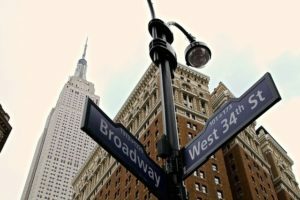 It has everything from the bright lights of Broadway and hubbub of Times Square to towering skyscrapers, Fifth Avenue and the Statue of Liberty. There’s so much to see and do! The good news is that the city really can be done in a weekend if you plan correctly. So why not sit back and read our handy guide? Before you know it, you’ll be booking your trip and seeing the sights yourself. You’ll land at JFK Airport on Friday morning. It’s the busiest passenger airport in the USA, 12 miles from the centre of New York. It was originally known as Idlewild Airport, until it was renamed after President John F. Kennedy in 1963. Once you’ve got your bags, jump on the AirTrain and you’ll be in the city centre in about an hour. Alternatively, if you don’t fancy public transport, you could always hail one of those famous yellow taxis – although you’ll pay around $60. If you don’t mind where you lay your head, there are plenty of cheap hostels available, and many have hearty breakfasts! If you prefer a hotel, make sure you’ve booked in advance. However, if you’re going down the hostel route, you can just walk in with a smile on your face. After you’ve checked in, you have to see the Statue of Liberty. 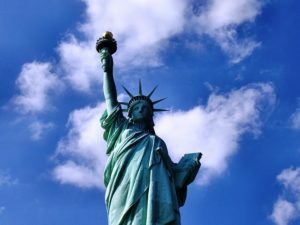 A world-famous symbol of freedom, the Statue was given by France to the United States in 1886 in celebration of friendship. You can get a perfect view and take some memorable photos. After that, grab a famous “pizza pie” at one of the many Italian eateries. By now you’re probably shattered after the flight, so take it easy with a stroll around Times Square. A major commercial intersection in Midtown, it’s beautiful when lit up at night. Not to mention the setting seen in so many famous movie scenes! Lap up the buzzing atmosphere before turning in. New York City has over 28,000 acres (110 km2) of municipal parkland and 14 miles (23 km) of public beaches. 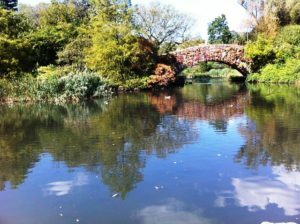 After a good night’s sleep, why not start the day with a jog through Central Park? No matter what time of year you visit, Central Park is a stunning sight. You’ll be in good company, as so many New Yorkers start the day this way. The park, which receives around 35 million visitors a year, has the highest traffic of any urban park in the USA. Run done, make sure you re-fuel with some world-famous hash browns, eggs ‘over easy’ or pancakes with maple syrup! Saturday afternoon should be spent with a visit to the Empire State Building. It’s a 102-floor skyscraper and cultural icon. Standing at 1,250 feet (381 meters) high, it was the world’s tallest building from 1931 – 1972 when the World Trade Centre was completed. After 9/11, the Empire State Building was again the tallest building in New York. When visiting, be sure to buy your e-tickets on the official website before your trip. You can print them, avoid the queues, and go straight to the elevators. Be sure to buy an audio guide; it’s worth the few extra dollars and makes your visit memorable. If you’ve got time, swing by the National September 11 Memorial on your way back to your hotel. A sombre a place of remembrance, it consists of two massive pools set within the original footprints of the Twin Towers with 30-foot waterfalls cascading down their sides. Have an early dinner, and then spend your Saturday evening on Broadway and take in a show! The best way to get your Broadway tickets at a reasonable price is to get them online on the Friday afternoon under last-minute deals. You’ll then be able to tick “see a Broadway show” off your list! Spend your final day shopping. After a good breakfast, head on over to see the multitude of stores on Fifth Avenue. With what’s on offer, it’s a definite must for your stay. Right in the centre of Manhattan, the best Fifth Avenue shopping takes place between 39th and 60th Street. Whatever you want, whether it’s the latest fashions or useful housewares, you’ll find it on Fifth Avenue. By now your trip will almost be complete, so you’ll need to wave goodbye to NYC. Your Sunday afternoon will be getting back to JFK, but before you go, make sure you fill up with a hearty lunch in Chinatown. It’s home to the largest number of Chinese people in the Western hemisphere. Make sure you try one of the “all you can eat” buffet restaurants before you leave. Once back at JFK Airport, you’ll have plenty of beautiful pictures and amazing memories before catching your flight home. So there you have it: our guide to New York in a weekend. With a bit of forward planning, it really can be done. Have a safe trip!